Photo courtesy of Lunchbox Theatre. With Bells On—a world premiere comedy—is written by playwright and drag artist, Darrin Hagen. It is a holiday tale complete with sequins, high heels, bells and wigs. It is no secret that riding an elevator can sometimes be a tad discomforting. People stand on opposite ends of that vertically moving rectangular box, squeezing themselves into the corners. Since the invention of such a unit of transport, elevators and humanity’s personal space have been mortal enemies. But as Lunchbox Theatre’s most recent comedic production With Bells On showed audiences, a simple elevator ride with rather “fabulous company” can be testament to the fact that anyone can come out of their shells. For straight-laced, conservative Ted—portrayed with awkward hilarity and naivety	by Lunchbox Theatre newcomer Stafford Perry—his first night out since his divorce was much different than expected. As the holidays loom closer, certain images come to mind when you think about the traditional Christmas tree: ornaments, angels, holly and strings of lights. Now, replace those conventional images with glittering red lipstick, a bleach-blonde wig, sparkling high heels, a dark green dress—adorned with bells, tassels and holiday cheer—and a light-up tiara. It’s not every day that a drag queen dressed as everybody’s favourite holiday flora enters an elevator. The stage, albeit nothing but a simple open-air black box, brought the audience into the elevator and into the world of Ted and Natasha—portrayed with brilliant poise and flamboyance by stage veteran Paul Welch. 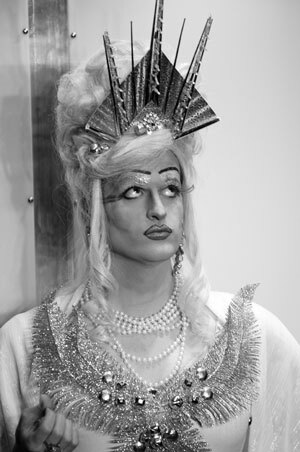 With Bells On—a world premiere comedy—is written by playwright and drag artist, Darrin Hagen. It is a holiday tale complete with sequins, high heels, bells and wigs. Just as Natasha ever-so-politely states, “dressing like this takes balls,” it sometimes takes just as much gumption to break free of the traditional or the ordinary— a key theme in the hilarious production. However, what a drag it would be if the queen herself rode the elevator to the main floor of the apartment and then just left. It is only when the elevator breaks down, that both Ted and Natasha are forced to get to know each other and their worlds. In a twist of the Cinderella story, Natasha must get to a drag show at the Magical Crystal Palace by midnight or else his rival will steal the Christmas Queen tiara from him. He has been practicing his showgirl routine to Anita Ward’s “Ring my Bell” for months. On the other hand, Ted is at a crossroads in his life, in which he has to make a choice to step out of what he knows. Already divorced, he is living in an apartment with only one small window. Just as Ted is afraid to break free, Natasha is afraid to show the world who he is on stage. In a sense, both of them need this night to just let go. However, what they need first is to get out of the elevator. With Bells On, directed by Ian Prinsloo, is a holiday story with a twist. With one part drag queen and one part ordinary man, it is a tale of understanding and friendship. With Bells On runs until Dec. 18 at Lunchbox Theatre.